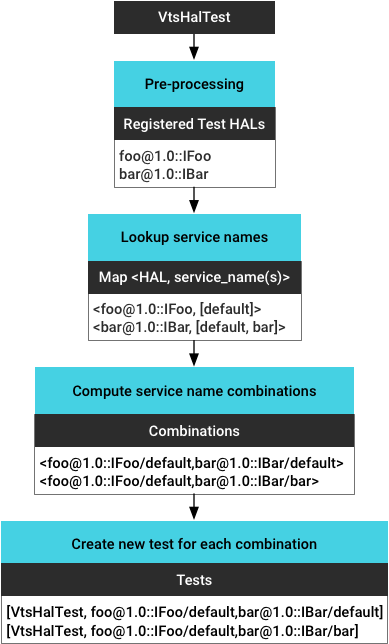 Android 9 includes support for obtaining the service name of a given HAL instance based on the device on which Vendor Test Suite (VTS) tests are running. Running VTS HAL tests that are service name aware enables developers to automate testing vendor extensions, multiple HALs, and multiple HAL instances on both target- and host-side VTS test runs. Each instance of the running HAL service registers itself with a service name. Reliance on the test developer's knowledge to set the correct service name. Limited to testing against a single service instance by default. Manual maintenance of service names (i.e. because names are hard-coded, they must be manually updated if the service name changes. Vendor HAL extensions. For example, when a vendor has an implementation of camera.provider HAL that runs on vendor devices with a customized service name, VTS can identify the vendor instance and run the test against it. Multiple HAL instances. For example, when the graphics.composer HAL has two instances (one with service name "default" and one with service name "vr"), VTS can identify both instances and run the test against each of them. Multi-HAL testing. Used when testing multiple HALs with multiple instances For example, when running the VTS test that verifies how the keymaster and gatekeeper HAL work together, VTS can test all combinations of service instances for those HALs. Register targeting HAL(s) in the test. List all the registered HAL(s). Get service name(s) for registered HAL(s) provided by VTS framework. Pre-processing the test binary to get all registered test HAL(s). Identifying all running service instances and getting the service name for each instance (retrieved based on vendor/manifest.xml). Calculating all instance combinations (to support multiple HAL testing). Generating a new test for each service instance (combination). // "default" is the default service name you want to use. For additional examples, refer to VtsHalCameraProviderV2_4TargetTest.cpp. VTS host-side tests run test scripts on host side instead of test binaries on the target device. To enable service name awareness for these tests, you can use host side templates to run the same test script multiple times against different parameters (similar to the gtest parameterized test). The hal test script specifies the targeting HAL service(s) in the test. 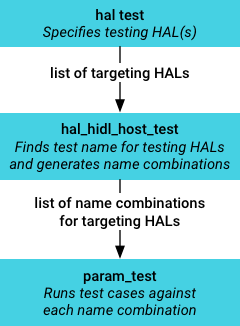 The hal_hidl_host_test (subclass of param_test) takes the registered testing HAL(s) from test script, identifies the corresponding service name(s) for the testing HAL, then generates service name combinations (for multi-HAL testing) as test parameters. It also provides a method getHalServiceName() which returns the corresponding service name according to the parameter passed to the current test case. The param_test template supports logic to accept a list of parameters and run all the given test cases against each parameter. I.e. for each test case it generates N new parameterized test case (N = size of parameters), each with a given parameter. For additional examples, refer to VtsHalMediaOmxStoreV1_0HostTest.py. In previous versions of Android, VTS identified the testing HAL using the <precondition-lshal> option configured in AndroidTest.xml. This approach was difficult to maintain (as it relied on developers to configure the test properly and update the configuration accordingly) and inaccurate (as it contained only the package and version info and not the interface info). Precondition checks. Before running a HAL test, VTS can confirm the testing HAL is available on the target device and skip the tests if it is not (refer to VTS testability check). Coverage measurement. VTS supports cross-process code coverage measurement via the knowledge about the testing HAL services it wants to measure (i.e. to flush the coverage for the hal service process).